In 2010, Ryan Young and I had an op-ed in IBD detailing how a recent regulation would empower the IRS to license tax preparers. We argued that it was a bad idea for several reasons. To my knowledge, we were the first people to write about this particular illegal IRS scheme. At the time I was dating a girl who later became my wife. Her grandfather, as luck would have it, is a tax preparer. He would have been put out of business immediately if that regulation had persisted. My girlfriend, now wife, worked at the Institute for Justice. Her grandfather soon became one of three clients in a case handed by IJ challenging that regulation. The case was Loving (et al) v. IRS. 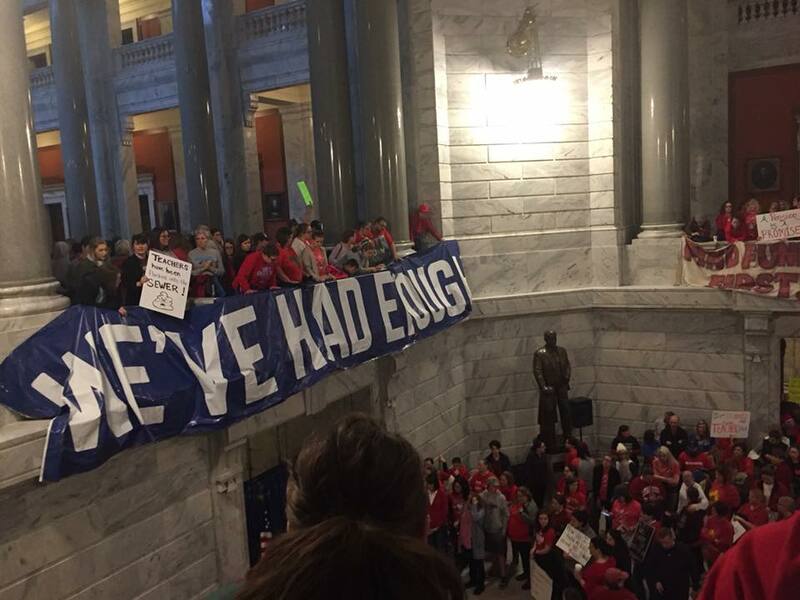 What Drives the Anger of Kentucky’s Education Establishment? I submitted a brief commentary to several of Kentucky’s public radio stations on the teacher protests and subsequent political activity. So far, no takers. The audio is here. The text is below. Please forgive textual errors. This was written to be read aloud. You radio people know what I’m saying, right? Enjoy. Teachers are angry at state government. So many teachers feigned illness in order to protest that many districts had to close on multiple days. Many teachers are now running for office. But why are they so angry? And more importantly, how justified is that anger? “A pension is a promise,” is the slogan so visible at teacher protests. The slogan is, at the very least, seriously misplaced. After all, lawmakers left pensions for current teachers and retirees virtually untouched. It’s safe to say that the crude rhetoric aimed at the governor and lawmakers is NOT over a nonexistent change. So what’s driving it? 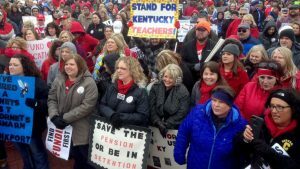 Teachers seem to be angry about three things: Reforms to Kentucky pensions adopted by the General Assembly and Governor Bevin, cuts to public sector spending, and a third thing that I’ll get to later. Teachers say they’re upset about two things with regard to pensions. The first is the way lawmakers did reform. I agree almost entirely. Late-night legislating included using another bill as a vehicle for some substantial, but let’s face it, overdue, pension changes. The tactics, separate from the substance, should strike everyone as a bit underhanded. The lack of transparency in the reform is the most reasonable source of outrage among teachers. Teachers also say they’re upset about the reform as applied to future pension beneficiaries. They say the changes will make it harder for Kentucky’s public schools to attract and keep good teachers. Data adjusted for cost of living and reported by National Public Radio in March shows that the average Kentucky school teacher earns more than the average teacher in 42 of the other 49 states. That same average teacher also earns more than the average Kentucky household. If you’re going to be a teacher, Kentucky is one of the best places to do it. But I doubt that concern about future teachers is the real source of anger among Kentucky’s education establishment. Yes, K-12 education spending as a share of Kentucky’s GDP has been in decline since 2009, but that’s also true for the rest of the country. According to the National Science Foundation, in 2014 Kentucky devoted 7% more of its available resources to K-12 education than the nation as a whole. That’s a big difference. But I suspect the real reason Kentucky teachers are so apprehensive about change … is a U.S. Supreme Court ruling that could be handed down at any time: Janus v. AFSCME. Janus is Mark Janus, a child-support specialist working for the government in Illinois. AFSCME is the American Federation of State, County and Municipal Employees, Janus’s labor union. Mr. Janus wants nothing to do with the union. He wants to opt out of the chunk of his paycheck he must fork over for union activities, political or otherwise. If the Supreme Court goes for Mr. Janus’s claims, public sector unions might never be able to compel contributions from government workers ever again. It’s a basic First Amendment issue of free association, and being able to decide what causes your money supports. So this anger, these protests, the teachers running for office, may just be the last hurrah for public sector unions and their waning political power. For Kentucky taxpayers who will pay for the past mismanagement of pensions, and Kentucky parents, who have been languishing in an education system that has consistently opposed even a little educational freedom, this change is overdue, as well. On #TeacherAppreciationDay, Are Teacher Uprisings Justified? Here’s a quick Cato Daily Podcast chat with Neal McCluskey about the recent teacher uprisings in Oklahoma, Colorado, Arizona, Kentucky, and West Virginia. How justified are they? Neal goes through some of the data here, here, and here. Some of the “Nation’s Top Teachers” met with U.S. Education Secretary Betsy DeVos and aired some of their concerns. Jon Hazell, Oklahoma’s teacher of the year, told DeVos that school choice policies are draining traditional public schools of resources in his state. He specifically referenced charter schools and private schools in voucher programs, Hazell told HuffPost. His comment received support from other teachers in the room. But Hazell, a Republican who voted for President Donald Trump, said he found DeVos’ responses to his concerns unsatisfactory. DeVos told Hazell that students might be choosing these schools to get out of low-performing public schools, he said. Emphasis mine. Let’s take this complaint seriously: By allowing wealthy (or merely resourceful) parents to take their children out of certain schools to pursue a better education, public schools can become bad. This comes from the loss of funds when parents remove their children. That’s average daily attendance money and funding tied to individual students. In states where school choice is more prevalent, it may also mean money that follows the student to the school that parents choose, and thus draining the “common schools” of some additional fraction of funding. These reductions will reduce resources available for instructional staff and materials. But Mr. Hazell may also be implicitly arguing that by exercising a choice, parents are “taking” better students to schools of choice. The argument here seems to be this: Test scores look bad because all the choosy parents chose a different school, and that sorting process makes some schools look better than others on paper. Regulators and state lawmakers will inevitably look to the poor-performing schools and say, “Why can’t you be more like this school that the wealthy parents chose?” It’s just an unfair comparison. If I’ve presented an accurate picture of Mr. Hazell’s concerns, the argument has intuitive appeal, but it holds some pretty troubling implications for what to do about the perceived problems: the draining of resources and allowing some students to leave (the ones who “can afford to get out”) while others must languish. If this represents the opinion of teachers generally, and not just Oklahoma’s teacher of the year, what would they propose as the fix? As a legal matter, it could necessarily mean overturning a case known as Pierce. The Supreme Court in that case threw out an Oregon law that required all young people to attend public schools. The decision in the case upheld the basic civil liberty of parents to play a decisive role in how their own children become educated. I can’t imagine that teachers want to overturn a landmark civil liberties case just so they can more effectively protect public schools from parents who just want their kids to get a more robust education. And if you view every parent as a potential threat to your preferred status quo, what does that say about your desire as an educator to serve their needs? Thankfully, this is simply not where the debate sits with respect to school choice. Public school teachers, however well-intentioned, know in their hearts that the ability of parents to choose a better school for their kids is a fundamental decision and one that no parent wants taken away. Any political move to rein in every parent who would otherwise exercise school choice will be met with outrage. Such a move would end the image of schoolteachers as lovable/underpaid/devoted public servants. In Kentucky, the animosity aimed at any form of school choice has become palpable, especially after teachers in Jefferson County appear to view the possible takeover of the school district by the state as a shadowy conspiracy to impose charter schools from Frankfort. Whether or not that’s a fair characterization, there’s no question that Kentucky’s largest school district has a long history of disappointing performance, most especially for the low-income and minority students who reside there. A state takeover might well be a starting point to provide those parents a more-than-passively-helpless role in ensuring a quality education for their children. We don’t know what evidence Robert Mueller has or how much of it was gathered, but critics of his investigation say much of it is already tainted. David G. Post says that argument is very likely exactly wrong. Subscribe to this podcast here. Edit (04/07/18): I want to clarify that I sincerely hope that this list of demands (likely produced by a group called “Teachers in the Lead”) doesn’t represent the views of the average teacher. If you are a teacher, please comment and let me know if you support this list. It’s been fun observing the fight over state pensions in Kentucky. What teachers don’t want seems pretty clear to me. What they do want is more of a mystery. A massive banner that reads “We’ve Had Enough” isn’t often accompanied by a white paper. This is the closest thing I’ve seen to an actual substantive policy proposal from teachers. I saw it here originally. I invite anyone who does or does not endorse this document to say so in the comments. My comments on each of these demands are in bold. We are experiencing a historic moment of positive change driven by educators in West Virginia, Oklahoma, Arizona, and elsewhere. Rather than waste this moment by merely standing guard over the status quo or reacting to incessant depredations, we want to move Kentucky education forward in ways that will benefit all stakeholders. We can no longer allow the Koch brothers, the American Legislative Exchange Council, and their lapdogs in Frankfort (who don’t even bother to read the legislation written on their behalf!) to dictate the agenda for our commonwealth. Therefore, we present this list of demands in support of Kentucky education. Make sure you file your state tax return before you sign the petition, because this shopping list looks pretty pricey. 1. We demand that our pension and retirement plans be improved, not dismantled. 1a. We want the inviolable contract for past, current, and future teachers to be honored in order to make teaching in Kentucky an attractive option for talented potential teachers inside and outside of the Commonwealth. 1b. Pension and retirement plans should be fully funded for current, retired, and future teachers. This fund should be legally off-limits for raiding to address revenue shortfalls. 1c. Teachers should be able to retire after 25 years of service, regardless of teacher age, or five years of service at age 65. No “Rule of 87.” Older teachers should be incentivized, not penalized, for working past 25 years. The inviolable contract essentially is a contract that the state cannot break. What these teachers want is to make that contract essentially open-ended. They want the current pension system (currently running pretty heavily in the red) to apply to all future teachers for the foreseeable future. I do wonder if financial economists can even estimate these kinds of costs out to, well, I guess infinity. It’s laughably absurd that an open-ended individual benefit be contractually extended to people who do not yet work for the government. Also, I’m not aware of any field of work outside the public sector where you simply retire with most of your salary until your death after a mere 25 years of service. Can you? Genuinely interested to know if these jobs exist. I might like one of them. 2. We demand that public funds only be spent on public schools. 2a. Research shows that overall, charter schools do not improve educational outcomes for students. Too many charter school operators have taken public tax money for profit and left their students struggling. Public funds should go to public schools. 2b. No public education funds should be diverted to for-profit or non-profit charter schools or for vouchers to attend private schools. 2c. No tax credits should be granted for donations or tuition payments to private schools. This seems like the core of what teachers want. The first demand on this list is essentially that generous open-ended benefits be given to all future teachers forever and never mind about the cost. The second demand is essentially that the state prohibit Kentucky’s low-income parents from ever having the kinds of choices that those same parents would have in the vast majority of other states. While I secretly suspect that these teachers really just don’t want parents to know what they’re missing in terms of educational choice, they’re clearly concerned that some revenues earmarked for education might someday be used by (gasp!) someone else to (gasp!) do just as good a job for (gasp!) less money. It’s got to be a horrifying thought if you’re a member of a well-coddled group of workers in Kentucky. Of course, the most enduring difference between a failing charter school and a failing public school is that failing charter schools usually close when students no longer want to go there. Why on earth would teachers be afraid of a business model like that? I have a few thoughts. It’s worth noting here that charter schools are public schools, they abide by many of the same regulations, and opening one in Kentucky is a gargantuan task that requires at least one level of government approval. These teachers might want to study up on Kentucky’s state constitution, as well. It already prohibits some of the choices that these teachers demand must never, ever, ever, ever be made available to Kentucky’s parents. Raise taxes. Do it now. Don’t look at the state budget. Stop it. There’s literally nothing wrong with any spending in the state budget. We looked. Well, OK, we didn’t look very hard. OK, fine, we didn’t look at all. We just don’t want to annoy anyone who currently receives a special state privilege to get miffed at us for trying to transfer that benefit over to us. Solidarity! We want new money. Fresh money. Now go get our money! 3a. No imposition of new sales taxes. Sales taxes are regressive taxation that disproportionately hurt small businesses, the poor, and the middle class, and should not be raised on non-luxury goods or services. The state should seek out new forms of revenue that don’t come at the expense of the poor and middle class while cutting taxes for the wealthy and corporations. Why on earth would teachers care about where the money they extract from the private sector actually comes from? 3b. No imposition of regressive flat taxes. The tax rate should remain 5.8% of federal Adjusted Gross Income for those earning between $8000 and $75000. In addition, rates should increase for the those earning above $75000 with the creation of at least two new tax brackets for the super-wealthy. For example, 6.5% for those earning above $150000, 7% for those whose federal AGI is between $250,000 and $999,999, 8% for those whose federal AGI is above a million dollars. Corporations based in Kentucky should pay taxes to Kentucky based on their earnings, not merely based on their in-state revenue and the rate should be progressive, and not flat, so as not to disproportionately burden small businesses. Ditto here. I admire the substance, but I can’t for the life of me understand why these teachers care about where the brackets break down for the purposes of revenue. 3c. Pensions should remain tax-free up to $50,000. This tax exclusion should not be lowered by one cent (much less by $10,000 as the current tax bill proposes). Raise taxes, sure, just not on us. Thanks. 3d. Find new funding sources by raising taxes, closing tax loopholes, and/or legalizing and taxing the same revenue sources that are already legal in other states (for example, recreational cannabis or casino gambling). OK, guys. I could have sworn I just read somewhere in this list of demands that you don’t want any new sales taxes. 4a. No more state funds devoted to building new juvenile detention centers, public or private. 4b. An end to zero-tolerance policies that disproportionately target underprivileged youth, LGBTQ youth, and youth of color. Eliminate SB 169. 4c. Increased funding for Family Resource and Youth Service Centers and funding for full-time trained therapists, youth service workers, effective restorative justice discipline programs, and crisis intervention specialists instead of armed school resource officers, regardless of Title I status. If we must have armed school resource officers, we want them to receive ongoing nonviolent conflict resolution training. 4d. Increased funding for all school breakfast and lunch programs. 4e. Increased funding for textbooks, classroom supplies, and technology. 4f. Increased funding for teachers’ professional development including maintaining funding for KTIP and increased funding for subsidization of teachers’ continuing education, National Board Certification and tuition reimbursement. 4g. Provide state-funded preschool for all three and four year-old children. More funding. These are the least controversial demands mainly because they’re leveled every single year. 5. We demand an end to the Windfall Elimination Provision and the Government Pension Offset. These laws, which both took effect in 1983, basically eliminate Social Security benefits for Kentucky pension recipients and their spouses. Eliminating the WEP and GPO have to be a priority for Kentucky’s senators and representatives in Washington DC. If our legislators stab us in the back again, we want to be able to count on the same Social Security that everyone else in the nation has. 5a. Teachers who have already paid into Social Security in their early careers should be allowed to collect their benefits upon retirement. This is probably the most salient point in this list. When Kentucky teachers were removed from Social Security, they were guaranteed a pension. That’s a promise that really ought to be taken very seriously given the fact that there’s no true fallback option. This is where future reforms should tread carefully. Unfortunately, I believe Kentucky teachers, at least the ones behind this list of demands, are utterly and completely unconcerned with anything outside their sphere of influence, and they’re not exactly brimming with ideas about how to get more bang for the buck in the classroom. There’s absolutely nothing in these demands about improving outcomes, raising Kentucky from its below-average performance for all that above-average pay to teachers. After watching the fights in Frankfort over all of this, I’m increasingly confident that sphere of influence won’t include my own children. I should get a hearty “thank you” when I save the public school system from spending that money, but I won’t hold my breath. As a practical matter, it’s not a good idea to argue that the most popular person in Kentucky shouldn’t get a big tax cut. There’s a banner that pops up occasionally around the Kentucky Capitol that seems to work for virtually every protest. It says, “WE’VE HAD ENOUGH” in all caps. It’s really kinda brilliant. It works for virtually any protest. If I had a sign-making business in Frankfort, I’d make sure to have a couple “WE’VE HAD ENOUGH” banners ready for any given protest group. Why yes, we do have various sizes and colors. Step into our showroom. What group did you say you’re with? It’s worth taking stock of precisely what Kentucky teachers (at least the ones protesting in Frankfort today) have struggled to endure. They’ve had enough of presiding over an education system that consistently ranks near the bottom for academic achievement while receiving pay that’s the 7th highest for teachers in America (when adjusted for cost of living). That’s well above the median household income for the commonwealth. They’ve had enough of lawmakers and a governor insisting that the best time to reform pensions was twenty years ago and the second best time is now. They’ve had enough of being told by financial economists that the pension promises of the past are putting a rather large hole in the Kentucky ship of state that won’t be alleviated for decades even with a substantial reform. They’ve had enough of any efforts to give low-income parents in Kentucky any choice among schools. They’ve had enough of the growing realization that there’s not much moral or constitutional justification for compelling their fellow teachers to support a union, and that the practice may come to an end this year. In short, I suspect the protesters have had enough of the complaints from people who just don’t want what they’re selling. Lawmakers, parents, taxpayers, and even presumably many of their own colleagues, I believe, have had enough. I lived in Northern Virginia for pert near ten years. Shortly after moving there, I learned from Scott Bullock at the Institute for Justice that Virginia had a particularly bad set of rules governing alcohol. Every bar owner, for example, is required to pay the full list retail price for booze. No case discounts. No promotional benefits for buying this versus that. Oh, and all of that alcohol has to be purchased at the same state-owned stores where the rest of us get our booze. But it didn’t stop there. Bar owners also are prohibited from alerting potential customers to information about drink specials. That is, bars aren’t allowed to tell passersby about the actual benefits of their own happy hours. Austin Bragg and I produced a short video detailing this issue in 2009. Now, thank goodness, the Pacific Legal Foundation and Chef Geoff are challenging these rules. The restrictions are obviously unconstitutional, but commercial speech just hasn’t received the protection it deserves. This is an overdue and welcome challenge. In my humble opinion, this is the winning argument for free trade. Imports are, as often as not, inputs into other manufacturing. These intermediate goods, if you care about employment in domestic industries that need these products, should be sourced as competitively as possible. Enterprising reporters should note which local businesses make extensive use of these inputs and find out what they think. The tariffs that POTUS wants to impose on steel and aluminum will make products made by Americans that make extensive use of steel and aluminum more expensive.